In small bowl, mix 1/2 cup water, the soy sauce and pepper flakes; set aside. In 12-inch nonstick skillet, heat oil over medium-high heat. Add chicken, gingerroot and garlic; cook and stir 3 to 4 minutes or until chicken is light golden brown. Stir in soy sauce mixture and peanut butter. Add broccoli and bell pepper; heat to boiling. Reduce heat; cover and cook over medium heat 4 to 5 minutes, stirring occasionally, until vegetables are crisp-tender. In small bowl, mix 2 tablespoons water and the cornstarch; stir into chicken mixture. Cook 1 minute, stirring frequently, until sauce is bubbly and thickened. Serve with rice. Sprinkle with peanuts and cilantro. Brown rice takes longer to cook than white rice, but you can cook it ahead and keep it stored in the refrigerator to heat when you need it. You can also find already-cooked brown rice in the freezer section by the vegetables or in shelf-stable pouches in the rice aisle. 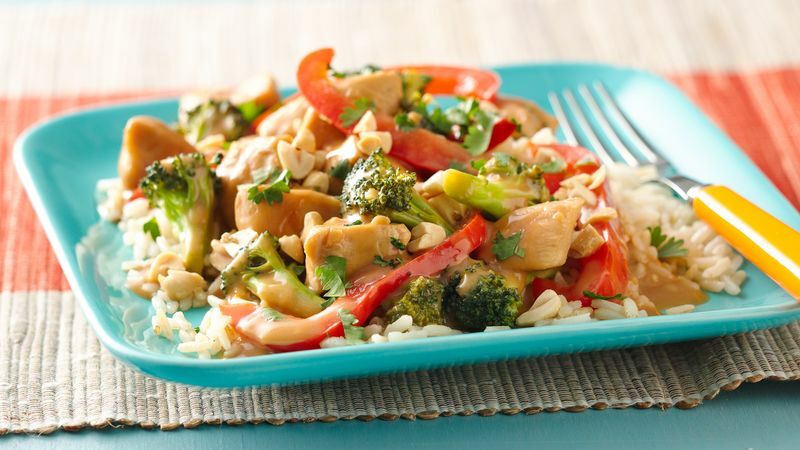 This stir-fry comes together quickly—it's a good idea to have all ingredients prepped ahead of time for the best results.